March 10, 2014, 2:37 p.m. This year Ash Wednesday fell on the fifth of March, marking the beginning of the Christian festival of Lent which will conclude on Easter Sunday. Lent, observed primarily by Catholics, is a 40-day period marked by sacrifice, repentance, and prayer in an attempt to refocus individuals on the Church and Christian values. This often takes the form of people abstaining from something that they enjoy for the duration of the holiday. 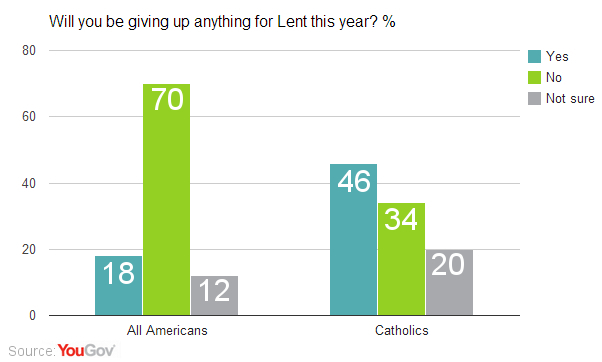 The latest research from YouGov shows that just under a fifth of Americans (18%) will be giving up something for lent this year, though 70% will not. Many Catholics (46%) will be giving something up for Lent this year, though just over a third (34%) will not. 17% of Protestants say that they will also be giving something up for Lent this year. 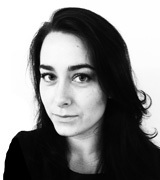 When asked what, exactly, they were giving up food was the most popular object of abstention. Over half said they would be altering their diet in some way, by giving up candy, meat, soda and other enjoyable (and unhealthy) foods. Several also said they would be giving up different types of media like reality TV, or Facebook. A smaller number of Americans said that they would be giving up something like drinking alcohol or smoking tobacco.